and improved your music experience with THD less than 1%. and effectively expand the Madden bass energy,and achieve triple balanced. Compatible with all devices with Bluetooth ,3 seconds fast matching Bluetooth within 69 feet range,auto memorize Bluetooth. You can easily switch between the four modes:Bluetooth /USB/AUX/TF (micro SD) /FM radio. waterproof, normally use in daily outdoor or indoor . 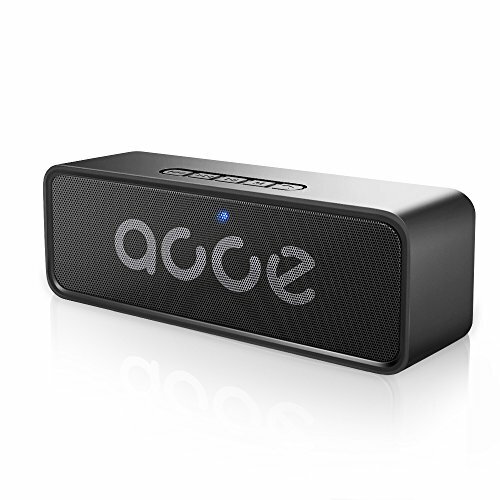 In addition, the strong external solid design tightly protects the interior of the speaker. The cutting-edge power-down technology,also be emergency charging as a mobile power,charging for mobile phones or tablet computers, plug and play, very fast. and the most humanization design is it can remind intelligent automatic voice report, gently press, immediately enjoy wireless HD calls when you in the car / kitchen / busy,as clear as face-to-face. √【Excellent Sound Quality】--- OJA portable bluetooth speaker built-in dual high-performance drivers and unique enhanced bass. Enjoy the wonderful music that brings you at anytime and anywhere.Even at highest volume,it shows crystal clear sound and strong bass without distortion. √【Connect Automatically】---Wireless Bluetooth4.2 transmission,applied for all Bluetooth devices,3 times the transmission rate of others, up to 69 feet.It connects to iPhone, iPad, iPod, Mac, mobile phone, and tablet PC within 3 seconds.It will automatically connect to the last device. √ 【Multi-functional mode】--- Besides bluetooth mode,it also supports U disk and TF card and AUX mode for non-bluetooth device.It makes you enjoy your favorite song list at anytime and anywhere.Built-in mic makes you take hands-free calls at any time. √ 【Ultra Portable】--- The portable Bluetooth speaker's size :3.15x2.5x1.7 inches.Up to 12 hours / 300 songs playing, suitable for business meetings, travel, camping etc.The remaining capacity of the battery can be confirmed on your device. √ 【What You Get】--- An OJA bluetooth speaker,an USB charging cable,an user manual,a 3.5mm AUX cable,friendly customer service.Trading is the starting point, but service has no end. If you have any questions about this product by OJA, contact us by completing and submitting the form below. If you are looking for a specif part number, please include it with your message.